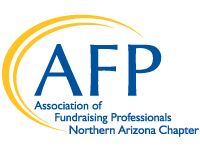 The AFP Northern Arizona CFRE scholarship reimburses an AFP Northern Arizona member for one half of the cost of taking the CFRE exam after the credential is successfully achieved. Applicant must be a member of the AFP Northern Arizona chapter to apply. To encourage fundraisers in Northern Arizona with 5 or more years of experience in the fundraising profession to pursue and attain the CFRE credential from CFRE International. Members of the AFP Northern Arizona Chapter who meet the criteria to take the CFRE Exam as outlined by CFRE International. A reimbursement check will be sent within 30 days for exactly 50% of the examination fee. This scholarship was created in celebration of Alice Ferris achieving her ACFRE Credential in 2010.